In a pressure cooker, cook banana. Remove the black thread from the center of the banana. Grind well to make a fine paste of it. From the grated coconut extract 1 cup of thick coconut milk, 3 cups of medium thick coconut milk and 4 cups of thin coconut milk. Dissolve jaggery in boiling water. Strain it. 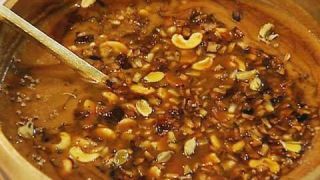 In a pan (uruli) mix jaggery syrup and the ground banana paste. Keep it on the flame. Mix and cook it. In between add ghee. When the water content reduces, add thin coconut milk and boil it. After that, add medium thick coconut milk and mix it. Finally add the thick coconut milk, cardamom powder, cashew nuts, raisins and coconut bits roasted in ghee. Do not let it boil – cook on low flame. 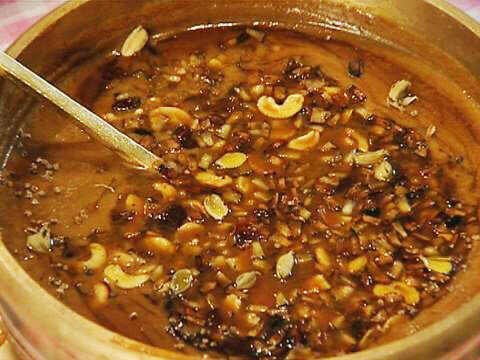 Tasty pazha pradhaman is ready.